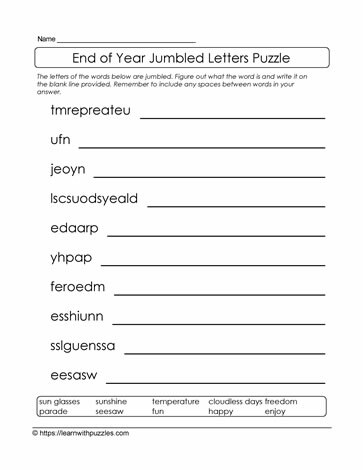 End of school year jumbled letters puzzle to keep kids engaged as they wind down towards summer vacation. The word bank gives vocabulary for end of year, as well as some activities that kids can do over the summer holidays. Solve the puzzle by unscrambling the letters in each question. Remember to include spaces between words and capitalize letters as needed. To create more of a challenge hide the word bank.